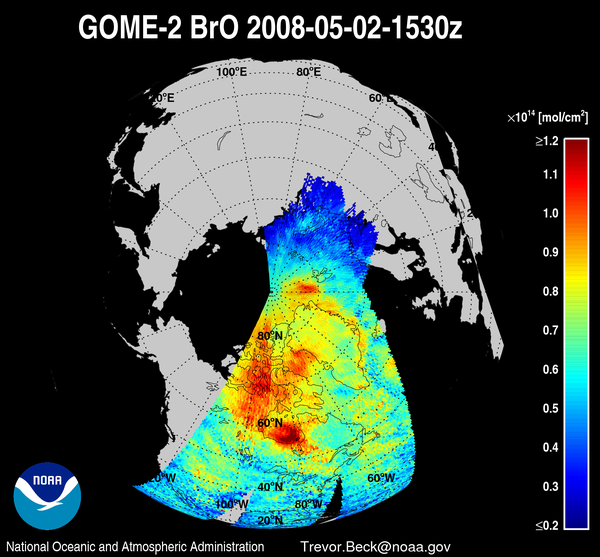 This page provides daily images of bromine monoxide (BrO) observations by the OMI and GOME-2 satellite instruments in support of the ARCTAS Spring 2008 campaign. 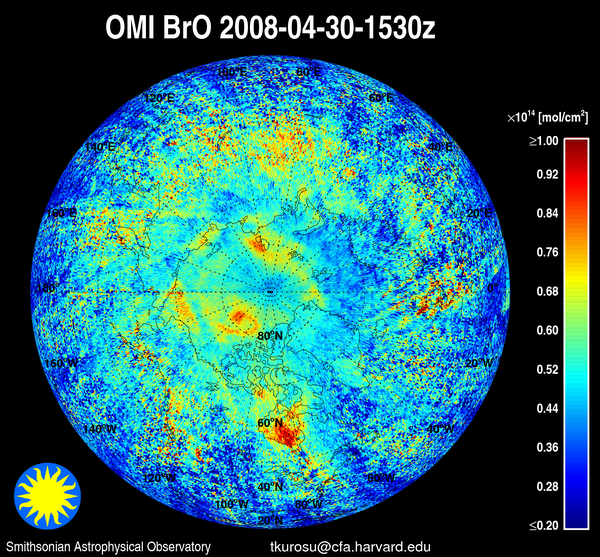 For each instrument, a single image contains a map of the total column BrO averaged over all data available within a 24h window before 15:30UTC (11:30EST). Images for the current and previous day are displayed on this page and are updated daily. Older images can be found in the Image Directory. Zoom images for the geographical region 55o  90oN, 180o  40oW are available on the Zoom Page. Unfilled/non-colored areas in the plots correspond to missing data. These are present, most notably, in GOME-2 towards the equator, since GOME-2 does not have the daily global coverage of OMI. Other reasons for missing data may include limited availability of processed BrO data within the last 24h, and the one-day-per-month spatial zoom measurement mode of OMI (see for example 2008-03-18). Images from the ARCTAS Summer 2008 campaign are available here. Note that OMI and GOME-2 images are generated with different color scales to account for the differences in dynamic range of the BrO columns from the two instruments. 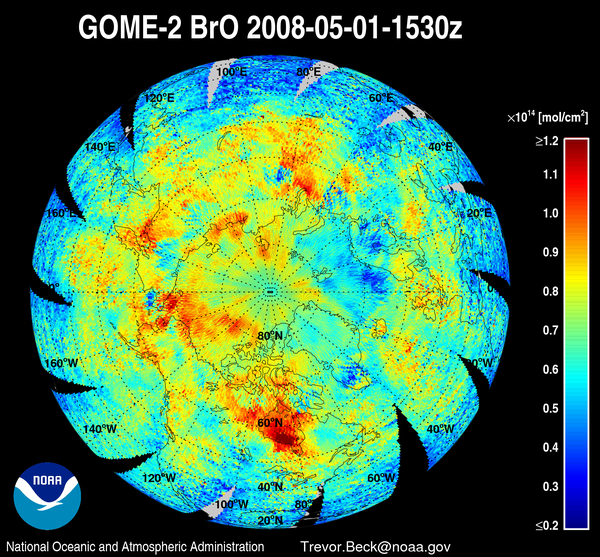 Both data sets are provided "as is", i.e., essentially unvalidated: GOME-2 BrO is a fairly recent product from retrievals that have been mirrored on the original GOME-1 approach, and OMI data are provided in a new version (v1.9) that has yet to be validated against correlative measurements. Neither data set is as yet suitable for use in scientific publications.